Growing a brand is tough in today’s competitive business environment. While acquiring customers is important, it is also vital for every business owner to constantly look for ways to retain customer loyalty. This will greatly benefit your business especially since researches show that keeping an existing customer costs five times less than attracting new customers. For Amazon, the world’s largest e-commerce store, providing excellent customer experience should be a top priority. Millions of consumers trust and are loyal to the brand because of its wide range of perks and reward options, including fast shipping, free returns, and special discounts. The company also values customer feedback, which helps them improve their service. Identify and deliver what your target market needs and wants. This practice makes it easier for tech giant Apple to build a loyal community. The brand constantly seeks feedback from and engages with customers. As a result, they’re able to develop products that customers will most likely love and buy! Powerful marketing tools and campaigns absolutely help Nike keep its loyal customers and attract a lot more! This popular shoe brand not only features celebrities and athletes in their ads, but it also discovers, inspires, and puts the spotlight on ordinary consumers. Nike also succeeds because of its enticing website, customizable products, and irresistible rewards program. People always look for great customer experience when doing business with a brand, and Starbucks makes sure that they deliver! Aside from their delicious beverages and other quality products, this popular global coffee shop chain also utilizes the power of technology to make ordering easy for their customers. They also have a rewards program that makes their customers happy and loyal. Cosmetics company and online subscription service, Birchbox, ensures its customers that their subscription and loyalty to the brand is rewarded. With its loyalty program, members get points for their purchase and referral. This strategy helps the brand retain existing customers and at the same time acquire new ones. Dollar Shave Club has mastered marketing its product and service enough for them to build a large customer base. From their entertaining video ads and witty copies to personalized emails and attractive packaging, they definitely know how to please their loyal customers. The brand also optimizes all channels to boost their reach and engagement. Brand awareness is important in order to develop brand and customer loyalty, and specialty retailer Express agrees! The brand’s previous loyalty program may have failed due to lack of awareness but they now practice a solid brand experience strategy that makes them stand out. Express showers their customers with rewards not only for purchases, but also for text messaging and credit card sign-ups, social interactions, app download, and other activities. 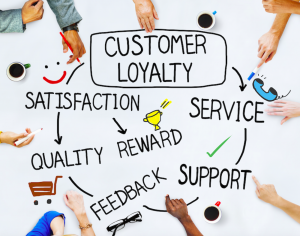 Excellent customer experience is key to improving customer retention. Strive to keep your customers satisfied and make them feel valued. Take note of these best practices from top brands. They could help your business boost customer loyalty, too! Our virtual assistants can help you with your business! Contact us to find out how we can work together.